Announced on the official YotaPhone site, a Russian company called Yota Devices is currently developing a new design on the traditional smartphone by offering two types of displays for different tasks. Using Android 4.2 Jelly Bean as the software development platform, the 4.3-inch LCD on the front of the YotaPhone runs at 1280 by 720 resolution (720p) and is powered by a 1.5 Ghz, dual-core Qualcomm Snapdragon chip. 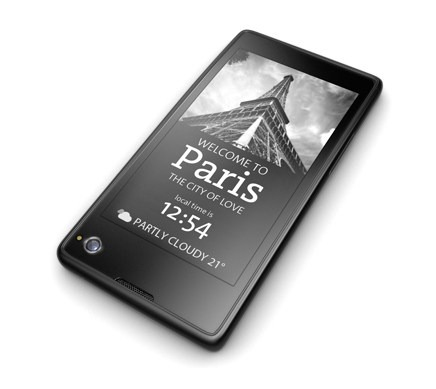 On the rear of the device, Yota Devices has installed a 4.3-inch E-Ink display similar to the type of screen found on an Amazon Kindle or a Barnes & Noble Nook E-Reader. Conceptually, the two screens are designed to work together to relay different information. For instance, the E-Ink display is perfect for delivering notifications about upcoming meetings or anything happening on social media networks like Facebook or Twitter. The display could also be set to constantly display basic information like the weather or the time. This could potentially help save on battery life since an E-Ink display requires less power to operate than a traditional LCD screen. In addition, a YotaPhone user could use the E-Ink display to read news or books in direct sunlight rather than being forced to find a good angle on the LCD side of the smartphone. However, the user will have to rely on a touch strip to control the E-Ink display rather than touchscreen controls on the LCD. In addition, third-party developers will have to create applications to support the secondary E-Ink display. 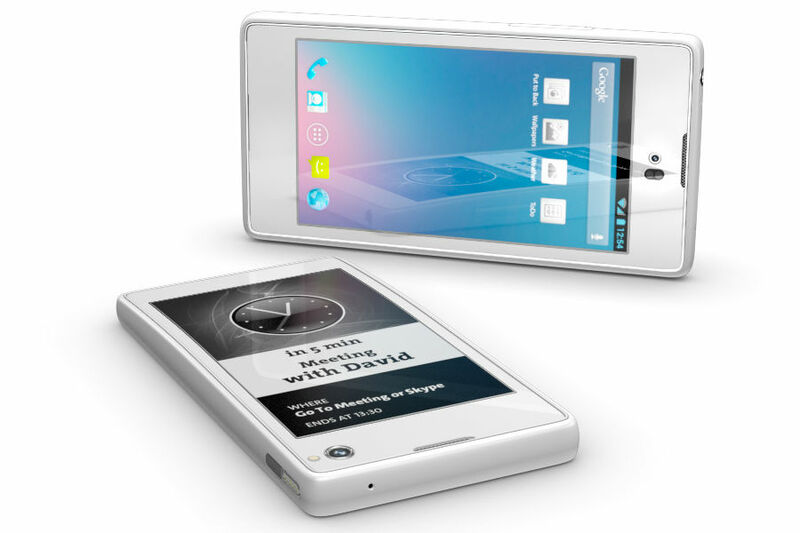 It may be difficult to encourage Android developers to include E-Ink display features unless the YotaPhone becomes extremely popular around the world. Interestingly, the LCD side also includes a touch strip that’s designed to replicate traditional buttons found on many Android smartphones. While the rest of the touchscreen reacts to finger taps, the strip offers basic Android navigation control like swiping between pages on the screen. According to Yota Devices, the smartphone will offer LTE connectivity as well as a 12-megapixel rear camera and a front-facing HD camera. Internally, the camera will operate on 2GB of RAM and consumers will have the option of 32GB or 64GB of flash storage for music, movies, games or other content. The smartphone is powered by a 2,100 mAh battery which is identical to the battery size in the Samsung Galaxy S III. Due to the two screens, the phone is slightly heavier at nearly five ounces compared to the 3.95-ounce iPhone 5 or the 4.7 ounce Samsung Galaxy S III. Yota Devices is targeting a product launch within Russia around the third quarter of 2013 and is currently in talks with wireless providers to bring the YotaPhone to North America as well as Europe. 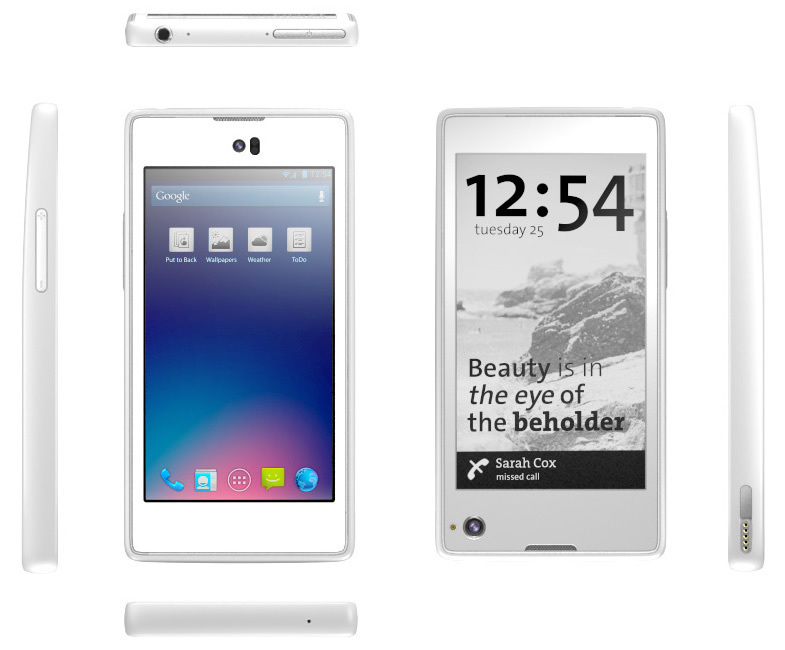 While Yota Devices won’t be showing off the YotaPhone at CES in Las Vegas next month, the company does plan to display the phone at the Mobile World Congress trade show in Barcelona during late February 2013.